A little over three years ago I was faced with falafel for the first time. Josiah and I were on our honeymoon and although I would consider myself an adventurous eater, was very hesitant of the Mediterranean cart that he had chosen for lunch. I had zero experience with falafel and minimal experience with any Mediterranean food. I once had a packaged gyro that ended up being okay, but other than that I had no experience. That food experience ended up being great, but admittingly not great enough to make me jump on the falafel bandwagon at that time. My biggest hangup was the warm hummus they served on it. Am I the only one that finds this insanely off putting? I still do! Fast forward another year. While we were living in Denver we found a meditanean shack (which is probably a super accurate description of it) and although it somewhat satisfied our mediteranean cravings, we weren't blown away. Fast forward again to last March. I was working in Lincoln Park when I stumbled upon Chicago Halal, a food truck turned brick and morter that has the falafel that changed my life. No exaggeration. We've quickly become regulars there. Like, first name basis with Steve and his crew. (HI STEVE!) It's our go-to cheap lunch or dinner when friends are in town or we're not feeling like cooking. I always order the same thing: the salad with half falafel and half gyro meat and ALL THE TAHINI! And yes, I emphasize the tahini like that every single time. I usually end up with about three containers and use all of them and would use more if they gave it to me. This is where my love affair with falafel happened. I can get a gigantic salad for $7 and I generally get two meals out of it, which is such a bargain! However, as much as I would love to run down to Lincoln Park every time I have a craving, it's a bit of a trek so I wanted to create a version I could make right at home. This recipe stemmed from no less than #689 attempts so the ability to deliver it to you brings me so much happiness. I love eating the falafel in a bowl form because it allows me to maximize my veggie consumption. It also adds some interest Something worth mentioning, the dried chickpeas are NOT optional. You can produce good falafel with canned chickpeas, but if you want GREAT falafel (which I mean, come on guys, that's what we're after!) you will need to soak your beans for 24 hours. Preheat oven to 400˚F. Grease a small baking sheet and then set aside set aside. 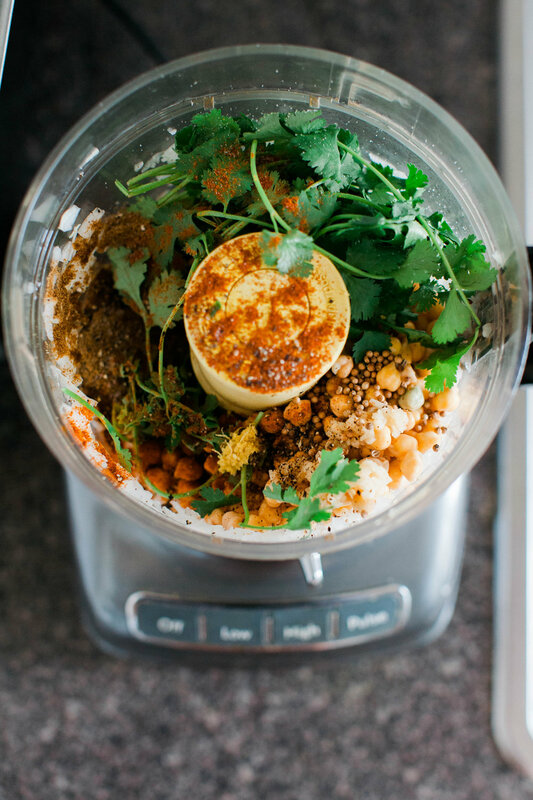 Drain the water from the chickpeas then add them to the base of a food processor along with the remaining ingredients. Process mixture until paste-like, scraping down the sides as needed. Be sure not to over-puree. There should be some chunks still remaining in the mixture. Scoop the mixture out in 2 tablespoon increments. 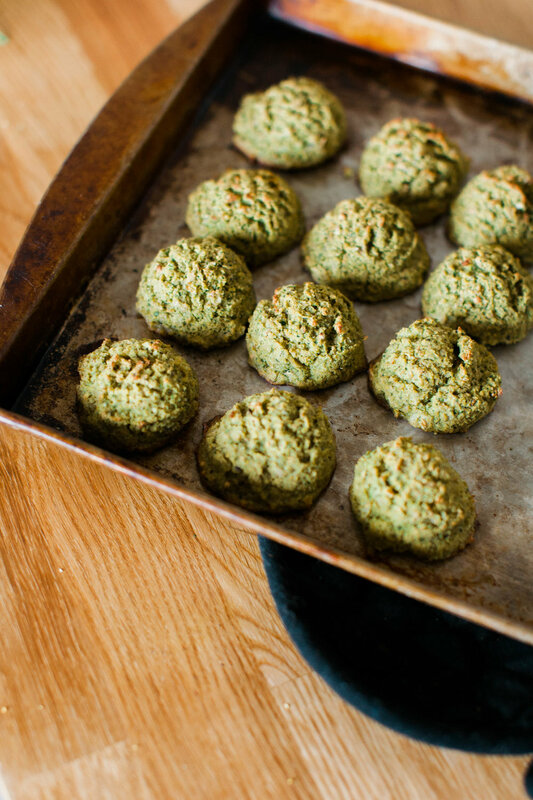 Drop the falafel mixture onto the prepared baking sheet and roll into round balls. Brush with the oil then bake at 400˚F for 22-24 minutes. Let the falafel cool before moving to an air tight container. 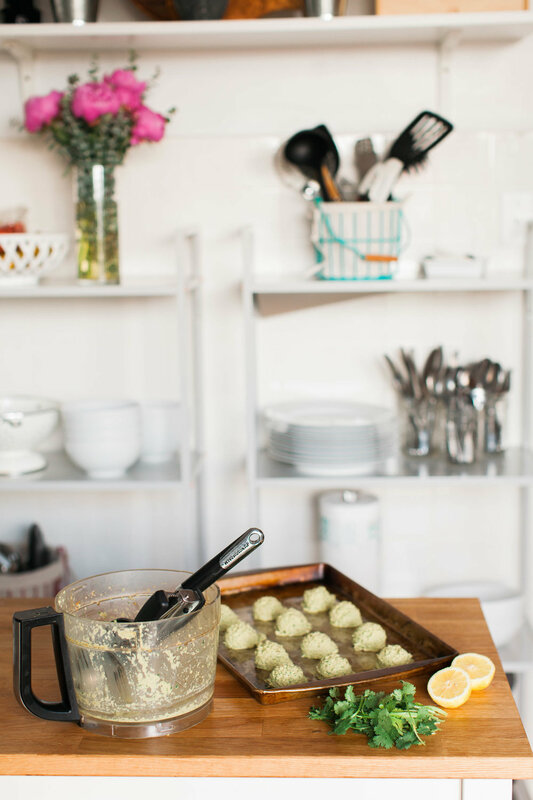 The falafel can be refrigerated for us to a week. 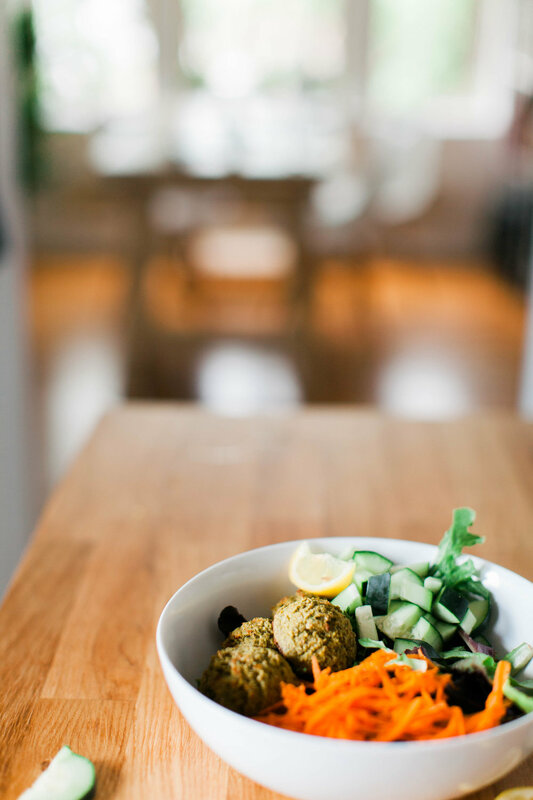 To assemble the falafel bowls place the falafel on top of a bowl of your favorite spring mix and add in various toppings including shredded carrots, olives, tomatoes, cucumbers, onion slices, pickles, lemon wedge, herbs, hummus, and this tahini recipe.